* Adaptors for some phones, landlines, PC are sold separately. Please see our adaptors section to find the one for your device and add it to your cart. Note: Unit will ship with standard headphone cable until newly designed volume control cable can be shipped to you, free of charge. 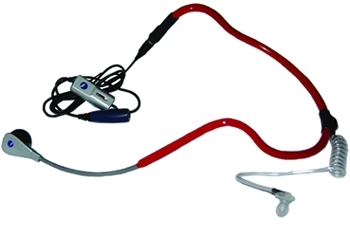 Includes: 1 standard 3.5mm headset adaptor. * theBoom configured for Treo and Blackberry cell phones MAY cause some Landline and Cordless phones to have low microphone output. Please only indicate one or the other, ie (blackberry/treo or cordless/landline). If both options are selected, we will automatically make them blackberry/treo compatible. 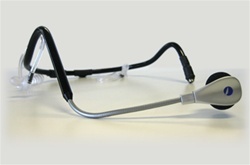 theBoom headset with single eartube. Custom made for each order - you can specify which side you would like the microphone (left/right) and the ear-tube speaker (left/right). Headbands available in black and five other brilliant colors! Even in the noisiest environment, theBoom E's patented noise cancelling technology delivers clear speech. You can have that important conversation no matter where you are. With theBoom "E", you will be heard loud and clear even at a whisper. Since there's no need to speak over surrounding noise, you can keep your conversations private and avoid disturbing people around you. 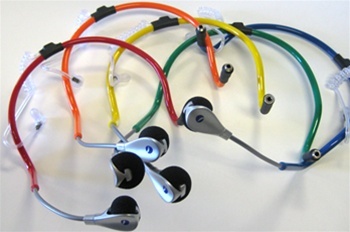 Mic and eartube can be made to fit on either side of the head.